All Striped Bass shown above where caught while on a trip with Beaver Fever Guide Service in Beaver Lake Arkansas. We specialize in Striper Fishing using live freshly caught bait. 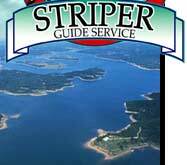 Contact Beaver Fever for more information on booking a Striper fishing trip on Beaver Lake in Arkansas.